An anthology of horror stories in urban settings—whether back alleys, crumbling brownstones, gleaming high-rise towers, or city hall. 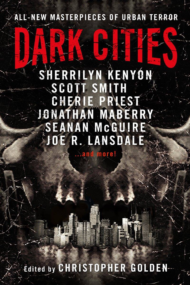 Terrifying urban myths, malicious ghosts, cursed architecture, malignant city deities, personal demons (in business or relationships) twisted into something worse…virtually anything that inspires the contributors to imagine some bit of urban darkness. Scott’s story “Dear Diary” explore the desperate loneliness some feel despite being being surrounded by millions of people.